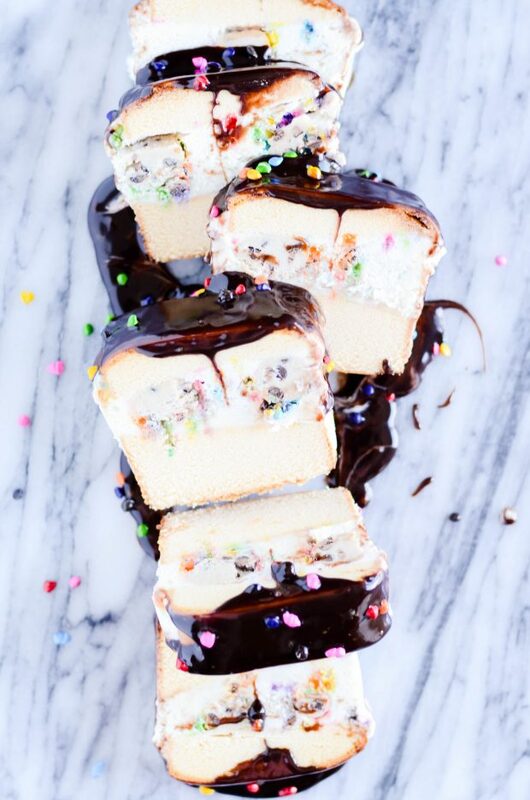 Here’s how to make a super simple and delicious cookie dough ice cream birthday cake! Summer is in full force around here! Swim lessons, air conditioning, hot leather seats sticking to your legs in the van, and daily ice cream runs. Plus, in our house, summer = all.the.birthdays!!! So I figure this easy ice cream cake is super appropriate. ???? Hot fudge or chocolate syrup or chocolate ganache or whatever else you want on top! That’s it!! How easy is that?? And really, you could use any flavor of ice cream you wanted to. I’m a vanilla girl, but I can think of plenty of other flavors that would be delicious in this cake. Cookies & Cream, chocolate peanut butter, or chocolate chip just to name a few! Can you see those huge chunks of cookie dough in the ice cream? That’s my favorite part. I’m such a cookie dough snob when it comes to ice cream. I like knowing that I made the cookie dough in this dessert. And I like that I can make the dough a little softer if I want (I don’t like really hard chunks of dough in my ice cream) by simply adding a little more milk to the recipe. This cake is so easy and SO good. I love that it doesn’t take a ton of effort. 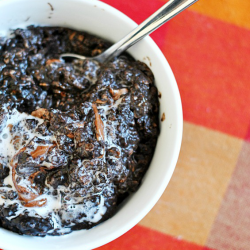 Outside of making the cookie dough (which is easily done with just a small bowl and a fork– no mixer required! ), there’s hardly any hands on effort required here. So what are you waiting for? 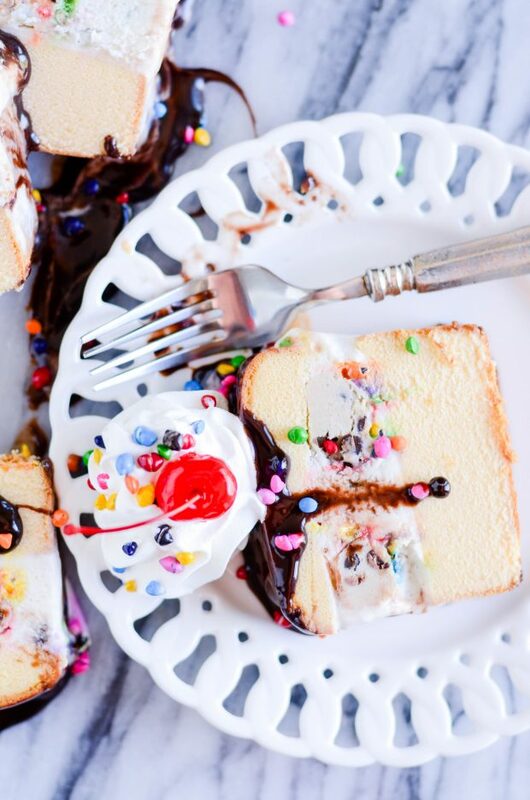 You’re just a few minutes away from the yummiest ice cream cake you’ve ever made! Happy Summer! 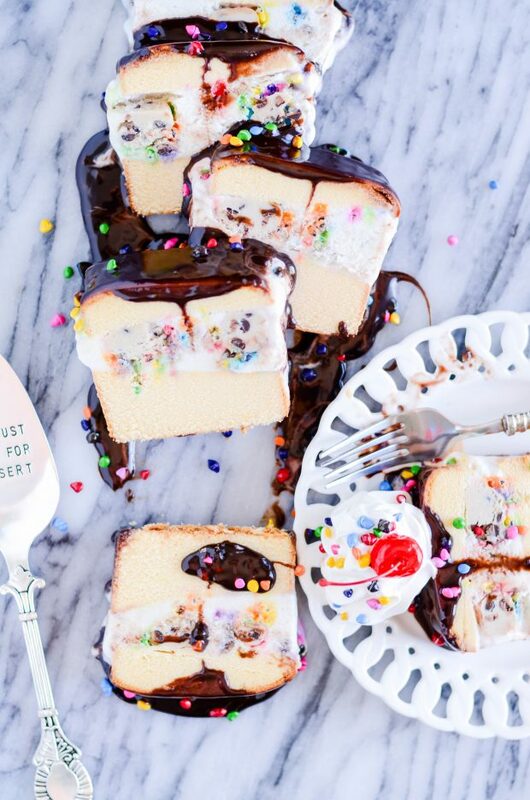 Here's how to make a super simple and delicious cookie dough ice cream birthday cake! 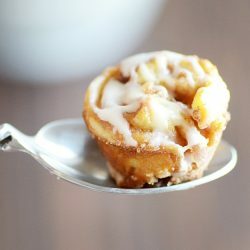 Use a fork to mash together the sugars and butter. Mix in the milk, vanilla, salt, baking soda, and flour, until dough forms. Mix in the chocolate chips. Set aside. Remove the cake from the tin and split into two layers. Line the tin with plastic wrap (with enough hangover to cover the cake after it's been filled). Place the bottom half back in the lined tin. Spread the softened ice cream over the bottom layer. Roll the cookie dough into bite-sized balls and press them into the ice cream layer. Sprinkle the rainbow chips over the ice cream and cookie dough. Press the top layer of the cake on top of the ice cream. Carefully pull the plastic wrap up over the top of the cake. Wrap securely (use more plastic wrap if needed) and return to the freezer for at least an hour. Let thaw for 10 minutes before serving. 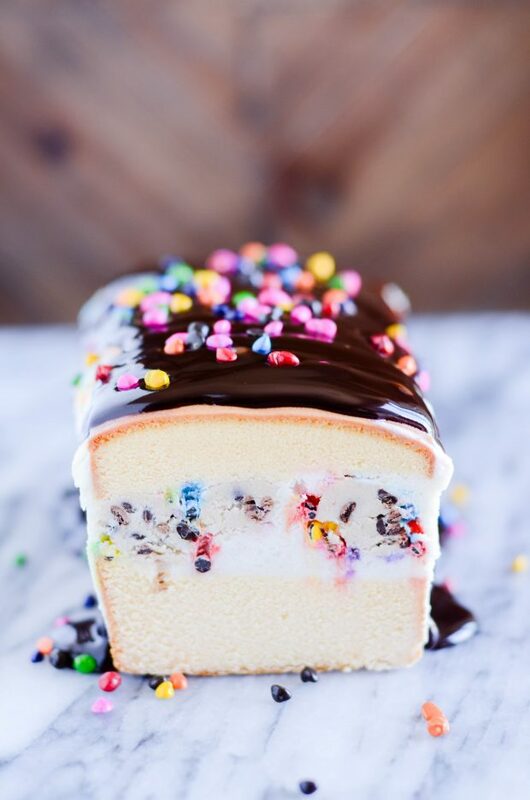 We make a lot of ice cream cakes, but this is new to me. I’m definitely going to give it a try. Thanks for sharing! Happy 25th Birthday!! The cake looks yummy!! Happy Birthday! Your bday cake looks delish! Happy Birthday! And, YUM! It’s hot here in Sacramento, so this dish is perfect! This looks awesome!! Happy Birthday to you!!!! Happy Birthday, Ashton! 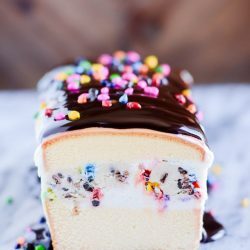 That giant ice cream sandwich cake looks wonderful and so festive. Thank you for sharing it at Joy of Desserts. My birthday is coming up this month…..I wonder if I email this to the hubby if he will have it made for me?? lol Looks delish! Hopping over from a linky party. This looks really good! And it would be different than the normal icecream cake we make. Bookmarking it! 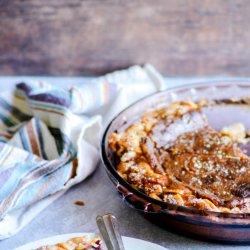 Thanks for sharing at What’s Cooking Thursdays! oh wow this looks fantastic..
Yummy site! I’m glad you posted this party at VB! Looks amazing! What a perfect birthday treat! Thanks for sharing on Sweet Indulgences Sunday. THIS LOOKS AMAZING.I WANT TI GIVE IT A TRY…BUT I I’M WONDERING, THE ROUND COOKIES ARE NOT GOING TO BREAK WHEN YOU PLACE THEM IN THE SPRINGFORM PAN? Mine didn’t! But make sure to let them cool before you move them, that should help!